The origins of this impressive building are thought to date back to the 13th century when Afonso III of Portugal recognized the geographical importance of Estremoz. Enlarged over the following centuries, its “Tower of the Three Crowns” is its main feature, and owes its name to Kings Afonso IV, Pedro and Fernando, who are thought to have been responsible for its development. However, perhaps its most notable historic significance is that Isabel of Portugal (also known as Elizabeth of Aragon), wife of King Diniz, died here in July 1336. 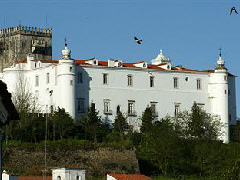 Later canonized by the Roman Catholic Church, she is sometimes referred to as Saint Elizabeth – hence the alternative name for the Pousada de Estremoz of Rainha de Santa Isabel. Its rich history is far, far too extensive to adequately detail here, but it is also said that in amongst visits by numerous Portuguese monarchs, King Manuel met with Vasco da Gama in 1487. As such, while the phrase “steeped in history” is generally overused, we can safely say that it very much applies to the Pousada de Estremoz - Rainha Santa Isabel.